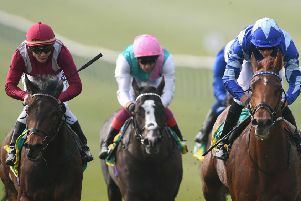 Fleeting and Donnacha O'Brien (dark jacket) surge clear to land the May Hill Stakes at Doncaster. AIDAN O’BRIEN warmed up for Saturday’s William Hill St Leger by landing the May Mill Stakes with Fleeting on Ladies Day at Doncaster. Though stablemate Peach Tree was more fancied for this Group Two race won 12 months ago by Karl Burke’s subsequent Group One heroine Laurens, Fleeting saw out the straight mile best of all under the trainer’s son Donnacha to score by a length-and-a-half and, in doing so, gallop into contention for next year’s 1000 Guineas. O’Brien senior has endured a quiet year by his own standards after his Ballydoyle stables were hit by a virus, but his horses are running into form and Kew Gardens heads the field for the St Leger – the final Classic of 2018. It will see O’Brien’s No 1 jockey, Ryan Moore, partner Kew Gardens before flying to Leopardstown to ride Saxon Warrior in the Irish Champion Stakes less than three hours later. O’Brien is, in fact, responsible for five of the 12 runners declared for the St Leger, with home hopes appearing to rest with John Gosden’s Lah Ti Dar and the Charlie Appleby pair of Old Persian and Loxley. The sole Yorkshire runner is Mark Johnston’s Dee Ex Bee. Meanwhile, The Great Heir repaid his purchase price several times over when scooping the £147,500 first prize in the Weatherbys Racing Bank £300,000 2-Y-O Stakes. Picked up for 33,000 euros at Arqana Sales in France in August 2017, the 33-1 outsider justified the faith of Hambleton trainer Kevin Ryan and owner Dave Stone with a narrow victory under Andrew Mullen.